The Lounge Machine Cocktail: Lillet, cognac, Hornitos Spiced Honey Tequila, and a lemon peel. I’m a big fan of Lillet. I bought a bottle years ago to try making a Vesper Martini. You know, the one James Bond orders in Casino Royale. While that drink is not my favorite, by any means, I have used it to great effect in the Gin de Provence, and it’s great in Drink.Well’s Spring Awakening Cocktail, and I even enjoy the stuff straight. This time, I reached into my refrigerator (yes, you should store Lillet in the fridge), and was about to pour myself a refreshing glass of the stuff, when I decided to turn it into a cocktail. stir it really well, and strain into a chilled coupe. Spritz a lemon peel into the drink, rub it around the outside, and bam! you have a very easy drink. It’s strong, sure, but it’s still quite drinkable and even refreshing. 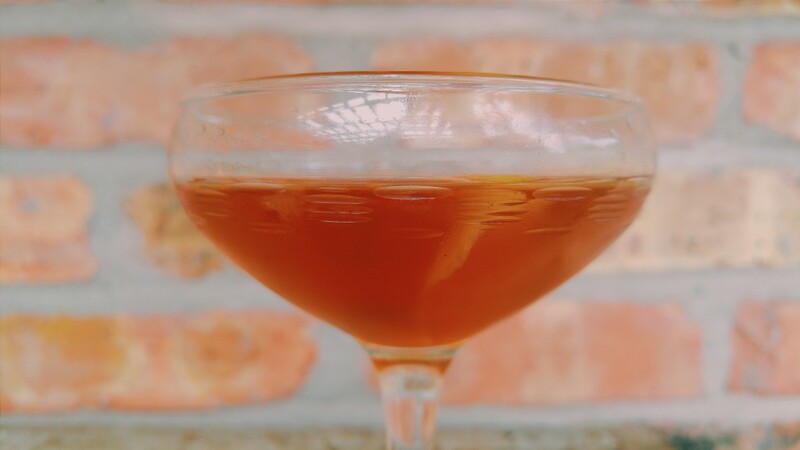 The Lillet is sweet on its own, and it complements the cognac nicely. The Spiced Honey adds just a tad more sweetness and a complex spice note that works well. I admit, though, that I can’t explain how or why the drink works. Wine mixed with cognac and spicy sweet tequila does not sound appealing. But it works, and it’s perfect for spring. So make yourself one. You don’t even have to juice anything. Just whip it up, and lounge on the back patio. That’s me, after all: the Lounge Machine.